Two years ago, Tom and Caroline Johnson committed suicide, one seemingly unable to live without the other. Their adult daughter, Anna, is struggling to come to terms with her parents’ deaths, unable to comprehend why they chose to end their lives. Now with a young baby herself, she feels her mother’s presence keenly and is determined to find out what really happened to her parents. But as Anna digs up the past, someone is trying to stop her. She soon learns that nothing is as it seemed. I was a huge fan of I Let You Go and I See You. I couldn't wait to start Let Me Lie. So imagine my disappointment when after finishing this novel, I couldn't give it more than two stars. Why this book didn't work for me? One of the reasons is the slow build up. I felt like it dragged way too many times. The writing was good but the action was minimal except when we get to the end of the book. 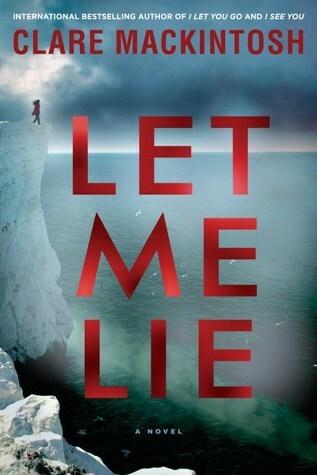 Also, Let Me Lie has plenty of twists including the ending but for this reader, they felt unbelievable. No one is sadder that this didn't work for me, than me. Anna Johnson recently became a mother. She loves her daughter and can't think about anything happening to her or she not being part of her life. Anna can't understand why first her father, Tom and then her mother, Caroline decided to take their own lives. But Anna has doubts, she's not sure they killed themselves. She believes that just maybe, someone is behind their deaths. So when a card gets to her home on the anniversary of her mother's death claiming foul play, Anna immediately believes it and right away, she takes it to the police. This is where she meets, Murray a retired cop who decides to dig into the past. Murray was my favorite character. He was smart and methodic. He was a good detective with excellent instincts. He was also a dedicated and loving husband. His side story was so full of anguish and sadness. In this, Mrs. Mackintosh did a great job at describing how mental health issues can affect the dynamic of a marriage. I won't say more to avoid spoilers but I hope that you enjoy this novel more than I did.